West Virginia Is Currently in the Firm Hands of Conservatives. We recently published our findings of the level of political affiliation intensity for the Mountain State in the lead-up to the midterm elections in November 2018. Not only is West Virginia a strong ‘red’ state, it’s should be considered crimson. I. There’s a deep uniformity of opinion among West Virginia Republicans statewide. Republican candidates for public office in the ‘Mountain State’ can develop a core political platform and expect it to resonate across the entire state. 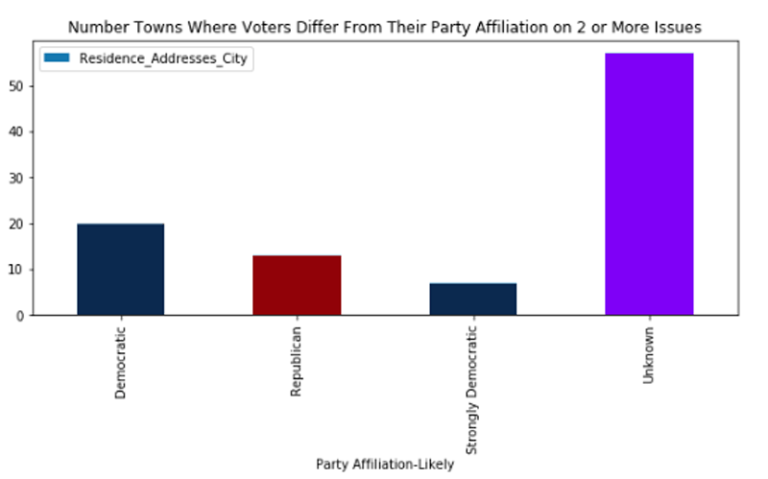 Using the criteria of local voters who differed from their political affiliation on two or more issues, West Virginians who consider themselves Democrats or Strong Democrats differed from their party more than twice as often as Republicans or Strong Republicans. II. Panther says, Don’t tax my smokes! For the most part, West Virginians don’t oppose the 10 cents increase in the state’s per-pack cigarette excise tax. But certain pockets of the state don’t want their habit to become more expensive. In Panther, 98 out of the 100 Democrats in the data download oppose the tobacco tax. III. Short-term value of big-ticket purchases key factor to WV consumers. Candidates or progressive organizations seeking insights into the overlap between the economy, consumer behavior, and party affiliation have key takeaways from the IQM data as well. Our predictive model measured three variables about big-ticket purchases–short-term value, long-term savings, and the purchases’ effect on the environment. On average in West Virginia, consumers’ top concerns followed traditional party norms. Strong Republicans focused on long-term savings. Strong Democrats cared primarily about their purchases’ impact on the environment. Overall, short-term value proved to be a strange indicator of consumer behavior. Statewide, mainline Democrats and Republicans favored short-term value at roughly similar rates; 10% of Democrats, 7.7% for Republicans. But those opinions varied greatly on the micro level. Democrats in 77 towns and Republicans in 99 towns were out of line with their party on big-ticket purchases. Political groups in 159 West Virginian towns were out of line with the statewide averages. However, in 50 towns, three or more political groups were out of line with their group opinion statewide. The IQM team of data scientists apply proprietary algorithms to voter files provided to them from their customers and industry-leading political data partners. The resulting findings help progressive campaigns craft more intelligent digital advertisements, reach more undecided voters and better track a voter’s journey to the booth. The IQM voter intelligence platform contains over 36,000 voter attributes to create an unlimited number of segments that can be viewed, analyzed, and optimized. IQM utilizes two leading business intelligence and voter campaign file management providers to summarize opinions by political affiliation and geography. We then identify issues across political affiliations and targeted geographies (such as towns, zip codes or counties) where the predominant stance by residents differs from the state mean by at least two standard deviations. To reduce statistical noise, we excluded geography/affiliation pairings with fewer than 100 voters.